Akam of the AOP is injured, another WWE performer is close to returning, a full rundown of the UFC's card from Brooklyn, Young Bucks appear at Defy card, Rumble participants & more. **We have a UFC on ESPN+ POST Show available on the site with Phil Chertok and I reviewing Saturday’s card from the Barclays Center in Brooklyn. We discussed the move over to ESPN, the attention Greg Hardy received going into the fight and his performance, the future of the UFC’s flyweight division after Henry Cejudo’s 32-second win over T.J. Dillashaw, Donald Cerrone’s 30th UFC fight, and lots more. **Nate Milton and Marcus Vanderberg of the Kings of Sport Podcast have launched their own Patreon site for additional sports content. Nate has been working with us for years and Marcus has been a long-time supporter and friend of the site, so I encourage you to check out their work. **Wai Ting and I are back Monday night with Rewind-A-Raw and the start of Royal Rumble Week on the site with a packed scheduled coming your way. For members of the POST Wrestling Café, we will have a new edition of the Double Shot up Wednesday morning and an enormous mailbag to get through as Ask-A-Wai returns on Friday. Plus, Jimmy Korderas joins us Thursday at 3 pm on the Café Hangout if you are a Double Double, Iced Capp or Espresso member. 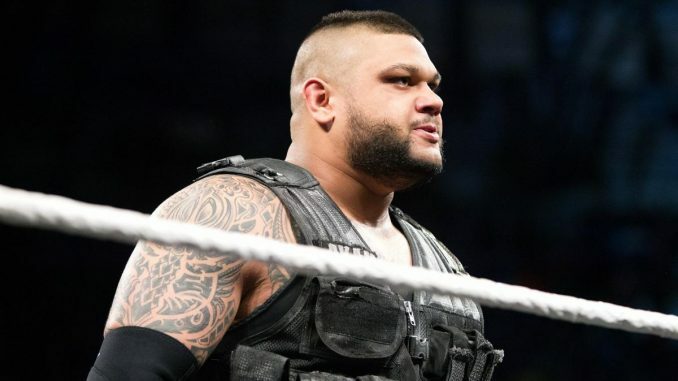 **Akam (Sunny Dhinsa) of the Authors of Pain is out of action with a knee injury. The news of Akam’s injury was first reported by Dave Meltzer on Wrestling Observer Radio. **Fandango is said to be close to returning after suffering a labrum tear last July. **The second episode of Season 4 of Total Bellas airs tonight at 9 pm Eastern on E! **Destiny Wrestling has a big show tonight in Mississauga, Ontario at the Don Kolov Arena at 4880 Tomken Road. The card is headlined by WWE UK champion Pete Dunne facing Josh Alexander along with Tyler Bate facing Aiden Prince, and Michael Elgin vs. Shane Strickland. The card takes place at 7:30 pm with tickets still available at www.destinyworldwrestling.com and at the door. **On Sunday, the WWE announced a new entrant for the women’s Royal Rumble every 30 minutes on their Twitter page. Charlotte Flair, Tamina, Naomi, Peyton Royce, Billie Kay, Dana Brooke, Lana, Nia Jax, and Nikki Cross were among those announced. **Ronda Rousey and Natalya will face Sasha Banks and Bayley on Raw this Monday from Oklahoma City at the Chesapeake Energy Arena. **Despite the women’s tag championship being introduced as one set of titles for both brands, I was told from inside the company not to expect any unification of other titles, but of course, anything can change between now and the launch on Fox. I’m always an advocate for fewer titles and having more challengers vying for them to achieve added credibility. The negative is that it eliminates spots if you have one tag title program spread over two shows rather than two sets of titles, although nothing is stopping them from having tag programs that don’t involve the titles. When you look at the depth of the tag division with both shows, it’s a very good tag division but neither is thriving on its own. While the brand split exists, I would assume the titles will stay separate with sets for each side. **The Revival is on the live events this weekend. They wrestled against Bobby Roode and Chad Gable on Friday in San Antonio and Saturday in Abilene, Texas. There is no update on their situation other than they were scheduled to speak with WWE officials. Dave Meltzer of the Wrestling Observer Newsletter has added that their contracts do not expire until April 2020. **The Young Bucks continued their tour of the independents with an unadvertised appearance at Defy Wrestling’s second-anniversary card Saturday in Seattle. The Bucks came to save Joey Ryan, who was being attacked by King Khash, Carl Randers, and Guillermo Rosas. The Bucks told the audience they flew in on their own and made this appearance for free, which Bryan Alvarez of the Wrestling Observer website reported was true. They promised to return to Seattle and said the health of independent wrestling is strong and put over the Defy locker room. Defy’s next card is February 9th in Portland, Oregon. **On Friday’s WWE house show in San Antonio, Baron Corbin came out for his match with Braun Strowman, who wasn’t cleared and began to have him counted out. Instead, Kurt Angle came out for an impromptu match that Corbin won after an eye poke. For a house show, that is a baffling result to have the surprise replacement, who is the babyface, lose. **Kid Lykos is believed to have suffered a separated shoulder during today’s tag match at Progress Wrestling’s Chapter 83 card. Lykos was teaming with Chris Brookes against Progress tag champions Will Ospreay and Paul Robinson. We have a full report on the show from correspondent Steve Harris, who said the injury occurred when Lykos was clotheslined to the floor by Ospreay and the audience could see he was injured. Progress put out a video update later in the day where they said that they believed he separated his shoulder. **Masa Kitamiya defeated Atsushi Kotoge on Pro Wrestling NOAH’s card from Hakata Star Lanes on Sunday to become the next contender for the GHC title. Kitamiya will challenge champion Kaito Kiyomiya on February 1st at Korakuen Hall. It has also been announced that Hakata Star Lanes will close at the end of March because of the building’s condition. **WWE Network News have descriptions for the 34 episodes of WWF Superstars that are scheduled to be added to the WWE Network on Monday. The episodes run from April 18th until December 5th, 1992. This was the period where Superstars was the top show for the company and syndicated across the country until Prime-Time Wrestling was revamped into Monday Night Raw in January 1993. The episodes start two weeks after WrestleMania 8 when a lot of talent departed the company including Hulk Hogan, Sid Justice, and Jake Roberts while the Ultimate Warrior returned at WrestleMania. **On Saturday, Bea Priestley won the World of Sport women’s championship from Viper. This followed Friday’s title change where Viper defeated Kay Lee Ray for the title. Kay Lee Ray appeared on camera at last Saturday’s TakeOver UK show and is expected to be joining the WWE. Viper dropped the SWA and EVE International titles at Stardom’s anniversary card last week with the expectation she is headed to the WWE as well. **The WWE Network will be premiering a new edition of “24” next Sunday after the Royal Rumble with a special on WrestleMania 34 from last April at the Mercedes-Benz Superdome in New Orleans. **MLW has announced that Ace Austin has been added to the SuperFight event next Saturday at the 2300 Arena in Philadelphia. **Pro Wrestling Tees has announced they have launched a merchandise store for Bret Hart. **Toronto-based artist Danny Granger is hosting his second “Art in Wrestling” exhibit on Thursday, May 23rd at the Superkick’d Studio in Toronto at 66 Fraser Avenue. The exhibit is dedicated to the late Johnny Gayle, who worked on Superkick’d events and had appeared on Aftermath TV. **The most successful Royal Rumble on pay-per-view took place on this date in 2002. The show was promoted around Triple H’s return from a torn quad to win the Royal Rumble and set up his championship match at WrestleMania. Hunter returned to television earlier that month in a memorable segment at Madison Square Garden with an unbelievable pop. They did have Hunter wrestle on the episode of SmackDown going into the Rumble teaming with Steve Austin against Booker T. and Kurt Angle. The Rumble card also featured Chris Jericho retaining the Undisputed title over The Rock and Ric Flair defeating Vince McMahon in a heavily-promoted grudge match. The show did approximately 670,000 buys on pay-per-view with an enormous amount of that number being drawn on Triple H’s return. **Henry Cejudo said he weighed 146 pounds going into the fight on Saturday night. On Friday, he weighed in at 124.5 pounds. **I didn’t come out of this event with any more optimism about the future of the flyweight division. The fight that makes the most sense for Henry Cejudo is going up to bantamweight and facing T.J. Dillashaw for the 135-pound title, and if he wins that fight, it’s hard to imagine him returning to flyweight. The problem for Cejudo at flyweight is the lack of star power with fights against Joseph Benavidez or the winner of Jussier Formiga vs. Deiveson Figueiredo not being pay-per-view level main events where Cejudo can make the most fighting on. Even with Cejudo has intentions of returning to defend the title after fighting for the bantamweight title, that would mean the flyweight title is inactive until the fall and the last thing they need is an interim flyweight title. **The Fight of the Night bonus was awarded to Donald Cerrone and Alexander Hernandez with Cerrone doubling with a Performance bonus along with Henry Cejudo receiving one, too. The bonuses were $50,000 each, so Cerrone netted $100,000 in bonus money. Cerrone and Cejudo were the stars of the show with the former putting out one of his best performances against a tough and younger opponent. From a viewership standpoint, Donald Cerrone’s fight may end being the most-watched due to his fight being in the featured spot on ESPN and the main card airing behind a streaming paywall. **According to Mike Bohn at MMA Junkie, Cerrone’s win on Saturday gives him the UFC record for most wins with 22, most stoppage wins with 16, most knockout wins by a head kick with 7, he is tied for most knockdowns landed with 18, and most fight-night bonuses with 16. **Dennis Bermudez announced his retirement after his win over Te Edwards on the preliminary card Saturday in Brooklyn. Bermudez started his career in 2009 and trained with former WWE wrestler Steve Blackman in his early days. He was 7-2 as a pro when he made it onto Season 14 of the Ultimate Fighter in 2011 with coaches Michael Bisping and Jason “Mayhem” Miller. Bermudez defeated Jimmie Rivera, Stephen Bass and Akira Corrassani inside the house before losing to Diego Brandao in the final. After the loss to Brandao, he won his next seven fights in the UFC before losing to Ricardo Lamas in November 2014. Prior to Saturday, his last win was against Rony Jason in August 2016 before losing four in a row to Chan Sung Jung by knockout and then three split decision losses to Darren Elkins, Andre Fili, and Rick Glenn. Bermudez retires with a 17-9 record at the age of 32. **James Lynch at Fightful spoke to Deron Winn, who defeated Tom Lawlor at the Golden Boy MMA event in November and was recently signed by the UFC. Winn stated that he was recruited by Gerald Brisco and was very high on the light heavyweight, but Winn is not interested in professional wrestling. In the same interview, he added that it was hard to see Kurt Angle go that route after winning an Olympic gold medal but understood why he did it. From that quote alone, Golden Boy could have had a unique promotion for the fight with Lawlor, as the latter tried to market the fight as Amateur vs. Professional wrestler. Winn trains at AKA in San Jose with Daniel Cormier and Cain Velasquez, the former is a huge wrestling fan and the latter has expressed serious interest in pursuing it after a recent trip to the WWE Performance Center last year. **The UFC is off next weekend and return Saturday, February 2nd with a Fight Night card from Fortaleza, Brazil headlined by Marlon Moraes taking on Raphael Assuncao along with Demian Maia vs. Lyman Good and former featherweight champion Jose Aldo fighting Renato Moicano. That weekend marks the beginning of nine straight weekends of UFC events. It would have been longer if the next Saturday’s UFC 233 pay-per-view wasn’t removed from the schedule. **The big card next weekend is the Bellator 214 show from The Forum in Inglewood, California. The show will feature the final of the Heavyweight Grand Prix with Ryan Bader, who is the promotion’s light heavyweight champion, facing Fedor Emelianenko. The card will also feature the MMA debut of Jake Hager (Jack Swagger in the WWE) as he faces JW Kiser, who is 1-1 as a pro but did have 18 amateur fights since 2010.